Mauricio Pochettino should forget about his loyalty to Tottenham if Manchester United offer him the manager's job, says Neil Warnock. The Tottenham boss is believed to be the front-runner for the permanent role at Old Trafford, with Ole Gunnar Solskjaer currently in interim charge, but Pochettino has played down any links to United since Jose Mourinho's sacking. Tottenham have climbed to second in the Premier League table, just six points behind leaders Liverpool and 13 clear of United in sixth. 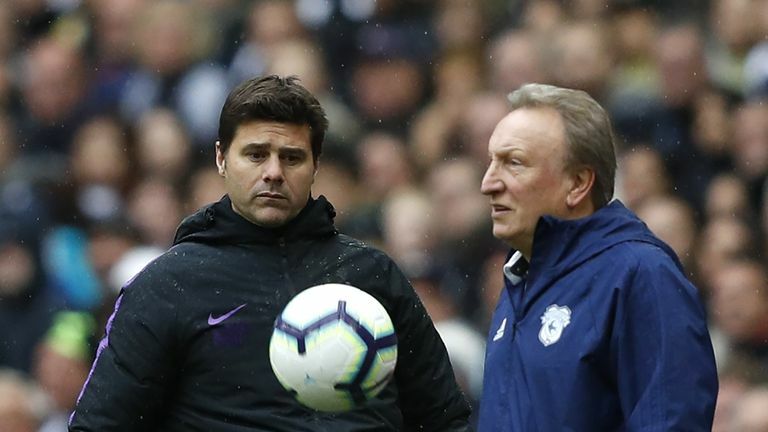 Despite the gap between Tottenham and United, Warnock believes any approach for Pochettino would "test" the Spurs boss, but warns that "the grass is not always greener". Speaking ahead of Cardiff's New Year's Day game against Tottenham, Warnock told Sky Sports News: "You do feel guilty, loyalty-wise. You feel that you don't want to let anybody down. "But, I remember when I got promotion with Notts County, Chelsea offered me a job and I thought a lot about it, turned it down and got the sack six months later. So when people talk about loyalty, I think that is a load of bull. "You have got to do what is right for you. There is a good time to leave a club and you have got to decide if that is the right time. Not just Pochettino, but any manager." Asked if any manager would be able to resist the lure of Old Trafford, Warnock said: "Absolutely. The grass is not always greener. Sir Alex [Ferguson] knew when he left that the place was not the same. They'd lost a lot and no one has been able to put that back. "It is still a big test for him [Pochettino]. Does he want that sort of challenge when he has got a new stadium and a squad he knows inside out? "But Manchester United are one of the biggest clubs in the world and you don't get that opportunity very often." Pochettino is yet to win a trophy with Tottenham, but has been widely lauded for his team's style and consistency, and Warnock believes the Argentinian is almost the complete manager. "He just gets the best out of players," Warnock said. "People talk about him not winning anything and when he finishes his career people will look back on that so it is important they do win something. "But a good manager improves players and that is what he has done. They have got to get a little bit more ruthless against the top teams in the cups and in the league, but that is all that is missing."